Just in time for parents and students alike to start thinking of whether they’ll need a new laptop for next semester, Lenovo has a new Chromebook for 2017. 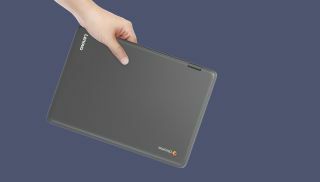 The Lenovo Flex 11 Chromebook brings much of the ruggedized features found in the ThinkPad line of Chrome OS for education to shoppers everywhere in a convertible hybrid frame. Starting at $279 (about £220, AU$370) when it hits stores later this month, the Flex 11 Chromebook comes housing an 11.6-inch, IPS touch display with a barely-HD 1,366 by 768 resolution, 4GB of memory and 32GB of storage – all powered by a 2.1GHz quad-core ARM processor. Lenovo hasn’t named the chip’s maker, but the MediaTek M8173C found inside the Acer Chromebook R13 wouldn’t be a bad guess. At any rate, that’s quite a shiny-sounding Chromebook for under 300 bucks that isn’t shiny at all, literally speaking. The Flex 11 comes in a deep gray, plastic frame that can take drops of up to 2.4 feet (75cm), outfitted with reinforced ports (including USB-C) and a sealed trackpad for spill resistance. If that already wasn’t music to parents’ ears, the keyboard is spill resistant up to 330mL, with channels underneath designed to route out liquids away from conductive components. The non-slip chassis is all-around ideal for children – or generally clumsy computer users – and weighs less than 3 pounds, improving its mobile appeal. A Lenovo-rated 10 hours of battery life should help with that. And, of course, the Flex 11 is Lenovo’s bid to get in with what seems like a trend on the horizon: Chromebooks running Google Play Android apps. As such, the firm promises strong performance with apps like Skype, Asphalt 8, Evernote and Slack. Naturally, we’ll put all of those claims to the test in a full review, so stay tuned before picking up this intriguing little laptop when it lands later this month.